The main theme of this new collection is the difference between surface appearances and the truth which lies beneath it. Colour is its keynote - silence is not absence of noise, the Minotaur, in the narrative which ends the book, is not a monster, Matisse did not grow up knowing he wanted to be an artist. There poems about music and sound and sequences which draw on the surreal. Here is a poem from the book. 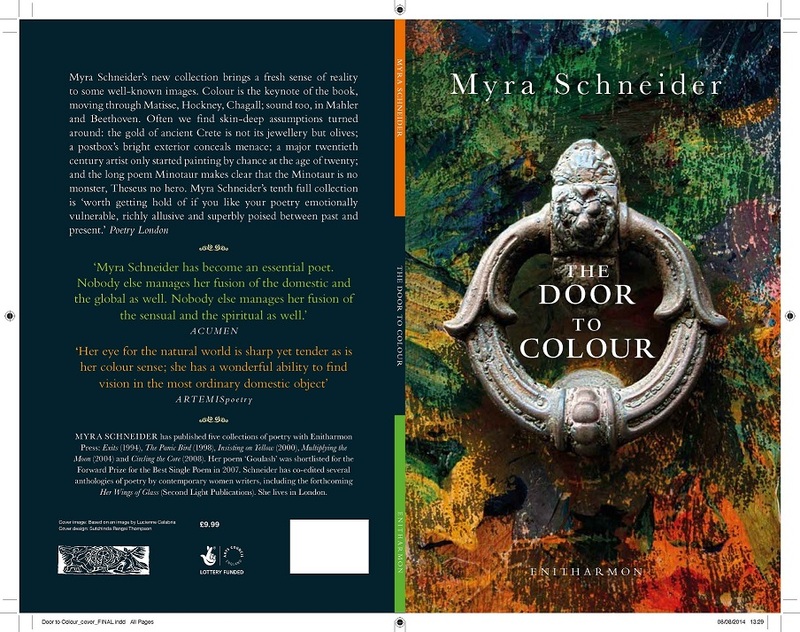 Yes, your Door to Colour is a beautiful book, your best, or maybe I should say, your most personally satisfying and moving to me among those I've read. I sat down to read it an hour or so ago and kept on reading, entranced… they maintain a voice that dissolves life into dream that couldn't be prose, has to be poetry. If I were to say which poems I liked most, I would have to say, "Kaleidoscope', 'Seeing into Things' and 'Finding Silence'. But I really responded, I think, to my sense of your presence, present in all of them. The collection, as you may have guessed by the title, is full of colour. I've picked a poem that I hope shows this, but one that also demonstrates another preoccupation in the collection, which is the object poem… Her object poems are often held together by a thread of free association. The poem is not really about the object - the object is merely the doorway or the path to a deeper concern. There are also lots of poems about music - both Mahler and Beethoven feature but perhaps my favourite part of the book was a long sequence at the end called 'The Minotaur' which explores an alternative view of the Minotaur and Theseus, the Greek hero who comes to kill him. The poem I've chosen, another one of my favourites is called 'The Throw'. I liked this one for many reasons - the careful details in the second stanza of the 'minute gold elephants' which 'walk in perfect lines' along 'the embroidered roads of the fabric'. I like that I was surprised by the ending, that last line 'where I wish pain, all pain to vanish'…The last line, which brings in pain took me by surprise, but when I went back to the beginning of the poem again, I realised there was a shadow of this pain in the very first stanza, when the throw 'becomes and extra skin/ one that's kind to my uncomfortable body.' Despite this dark shadow in the poem, I think it is overall a very positive poem - full of colour and imagination and life - the mind in this poem continues to free associate and think and dream, even whilst the body creeps into bed. one that's kind to my uncomfortable body. each the size of the top segment of my little finger. and they melt into the soft purplish mystery.